I hear a lot about people working really hard to be debt free, especially those working to go on their own sailing adventure. 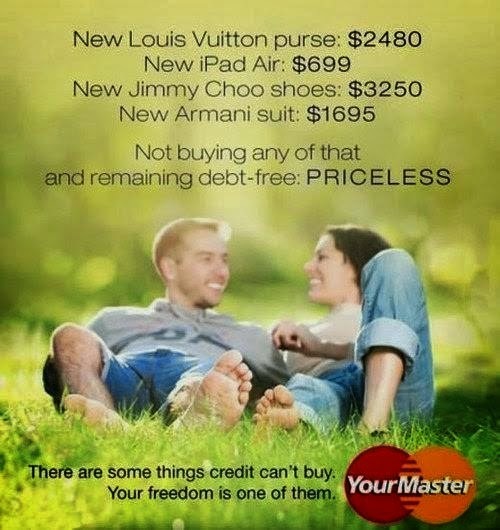 Afterall, being debt free can be almost as liberating as sailing away. Or maybe that's just me. I seriously applaud those that can get themselves totally out of debt before cruising, particularly the younger cruisers who aren't retired or don't have a stockpile of savings to fall back on. But for us, and many people that are not in the 'retirement bracket', debt free cruising just isn't in the cards unless we want to put our trip of another few years. We don't. I feel extremely fortunate, and proud, that Ron and I have been able to remain free of credit card debt and pretty financially sound. We are happy living beneath our means and have ZERO interest in keeping up with the Jones', actually we just sit back and laugh at our whitty, sarcastic jokes at their expense. Okay, we have an ipad (that we bought with gift cards from Ron's work related travel rewards). And a boat. But these were certainly purchased with a bigger picture in mind than just trying to impress people we don't know who probably don't care about our plans anyway. I still have student loans and we still have a mortgage on the house. But I'm absolutely A-Okay with that. Neither of our parents paid for our educations (or our house) and I wouldn't have it any other way. It might sound a bit weird but this debt comes with a small amount of....pride. As in, we are totally independent, responsible, accountable adults who can take care of ourselves. Although I'd probably have an entirely different view if my loans were at the 7.9% interest my poor brother has to pay on instead of the 3.1% mine are at. If we sold the house we'd make enough to pay everything off and have a few bucks for the kitty, but we're choosing to do the rental thing and keep the house....and the debt...for now. This is one of the major reasons I wanted to get the boat paid off before we left, which we've been fortunate enough to do! I salute those who can cruise 100% debt-free, but I also salute anyone who can make it happen with hardwork and discipline on any financial standing. So get your financial ducks in a row, whatever row that might be, and get out there, we certainly plan to! Great post - one of the things I love about the cruising lifestyle is that it is about spending your money on freedom (like your boat) rather than on stuff to keep up with the Joneses (like the right clothes, flash cars etc.). Super have lots of fun! What's a Few Thousand Miles Between Friends? Are Boat Surprises Always Bad?